The M12 FUEL 1/4 inch Hex Impact Driver once again raises the bar for 12V performance with best in class driving speed, power, and size. By focusing on productivity, this Impact Driver gets the job done faster by being over 20% faster in application speed vs. the competition. This tool outputs over 1,300 inch/lbs. of torque that allows the user to get more work done by completing a wide range of fastening. Measuring only 5.1 in length allows for unmatched access in tight spaces. The POWERSTATE Brushless Motor delivers up to 0-3,300 RPM with constant power output to drive screws faster. For use with M12 REDLITHIUM Compact Batteries or Extended Capacity Batteries which deliver more work per charge and more work over the life of the pack than competitive batteries on the market. The Bosch IDH182-B24 18V Socket-Ready Impact Driver Kit delivers cordless and socket-ready flexibility with corded driving performance. It comes with two CORE18V batteries and a fast charger for all-day jobs. The IDH182 two-in-one driver has both a 1/4 inch quick-change hex and a 1/2 inch square drive chuck. Its EC Brushless motor provides up to 1,650 inch-lbs. of torque, and the hammer and anvil system delivers max impact endurance. The CORE18V battery features next-gen Li-ion technology that produces 80% more power than previous cells. In independent tests, the driver powered by the CORE18V drove up to 947 drywall screws (3 inch each) into stacked 2x6s on a single charge. The battery's CoolPack 2.0 technology provides up to 135% more cooling effect than batteries without CoolPack. The fast charger charges a spent CORE18V to 80% ready in only 41 minutes. 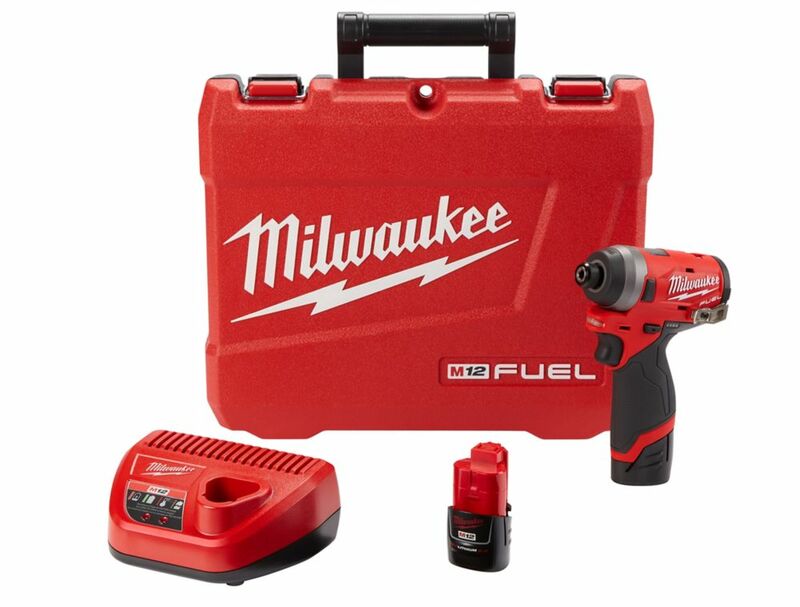 The Milwaukee M18 Cordless 2-Speed 1/4 in. Hex Impact Driver Kit offers incredible performance and power-to-size ratio. Featuring a Milwaukee-built 4-pole frameless motor and optimized impact mechanism, this impact driver delivers up to 2750 RPM, 3450 IPM and 1500 inch lbs. of fastening torque for class-leading performance. Its unique design offers multiple speed/torque modes through a proprietary 2-mode drive control and also features REDLINK Intelligence, providing overload protection using total system communication between the tool, battery and charger. For convenience, an all-metal, reversible belt clip is also included for temporary tool storage. M12 FUEL 12V Li-Ion Brushless Cordless 1/4-inch Hex Impact Driver Kit with (2) 2.0Ah Batteries The M12 FUEL 1/4 inch Hex Impact Driver once again raises the bar for 12V performance with best in class driving speed, power, and size. By focusing on productivity, this Impact Driver gets the job done faster by being over 20% faster in application speed vs. the competition. This tool outputs over 1,300 inch/lbs. of torque that allows the user to get more work done by completing a wide range of fastening. Measuring only 5.1 in length allows for unmatched access in tight spaces. The POWERSTATE Brushless Motor delivers up to 0-3,300 RPM with constant power output to drive screws faster. For use with M12 REDLITHIUM Compact Batteries or Extended Capacity Batteries which deliver more work per charge and more work over the life of the pack than competitive batteries on the market. M12 FUEL 12V Li-Ion Brushless Cordless 1/4-inch Hex Impact Driver Kit with (2) 2.0Ah Batteries is rated 4.7 out of 5 by 147. Rated 5 out of 5 by Thomas from Love the drill!!... Love the drill! !